The Printable Electronics Technology Centre (Petec) near Durham, UK, is to get £20 million to expand its facility and services. The centre, at NETPark in Sedgfield, will receive £12 million from the UK Government’s Advanced Manufacturing strategy, and £8 million from the Regional Development Agency – One North East. In the next four years it is estimated that this investment will stimulate the creation of up to 250 jobs in the North East and up to 1,500 jobs nationally. "One North East has been investing in PETEC for some time now, having identified printable electronics as one of the emerging industries that can drive the region’s economy forward," said Alan Welby, Director of Strategy at One North East. "The groundbreaking research and development work that has been taking place in Sedgefield is fast approaching a stage where it can become an area of major industrial growth and job creation for North East England." With 96 high end FPGAs and 26 quad-core Nehalem Xeon processors, the world's largest and most powerful reconfigurable computer has been launched at the University of Florida. Novo-G uses 96 Altera Stratix-III E260 devices, each with 768 18x18 multipliers, 254K logic elements and 204K registers, with 4.25GB of memory attached. These are housed in 24 GiDEL ProcStar-III quad-FPGA boards and supported by the 26 quad-core processors, 20Gb/s non-blocking DDR InfiniBand, GigE, and 576GB total RAM. “Although Novo-G may at first sound like it only serves as a research machine in the HPC realm of reconfigurable computing (RC), in reality it supports equally well the HPEC (embedded) realm of RC,” he said. “The boards featured in Novo-G (GiDEL ProcStar-III) are themselves originally marketed and intended as embedded processing boards, each with four big FPGAs with many attached memory banks plus various other supporting devices. We happen to be putting and using more of them in a single machine than anyone has attempted before and researchers can focus on issues with a single FPGA, a set of two, three, or four FPGAs on a single board with fast streaming pipes between, or many FPGAs (up to 96) spanning multiple boards, as their needs require. Thus, Novo-G will be supporting RC research projects that span the HPC and HPEC sides. Novo-G will support a variety of tools, including vendor tools as well as various CHREC tools for formulation, design, translation, and execution. At the device level, Novo-G of course supports applications design with VHDL and Verilog, but also several high level ESL programming languages. CHREC research equipment features a broad assortment of high-end FPGAs, accelerator boards, servers, clusters, and scalable systems. RC resources include those from AlphaData (boards), Altera (devices, boards, tools), Celoxica (boards), Cray (machines), DRC (machine, module), GiDEL (boards, tools), Nallatech (boards, cluster, tools), Pico Computing (boards), SGI (machines), SRC (machines), Tilera (GFE board), Xilinx (devices, boards, tools), and XtremeData (machines, modules). Microchip has developed the industry’s first 12bit Quad Digital-to-Analogue Converter (DAC) to include non-volatile EEPROM, enabling the DAC’s configuration to be loaded automatically during power-up. The low power of the device targets portable consumer applications such as personal media players, digital cameras and GPS devices as well as industrial and automotive. The on-board EEPROM, coupled with an internal voltage reference, four-channel architecture and rail-to-rail precision output amplifier, enables the MCP4728 to significantly reduce the size and component cost in a variety of battery powered and power-constrained applications. Through the integrated I2CM serial interface, designers can configure the MCP4728 input codes, configuration bits and I2C address bits. This configuration information is stored in the non-volatile EEPROM and therefore retained after power is removed, making it available immediately after power is reapplied and reconfiguring the DAC during power-up. The architecture of the MCP4728 also allows each of the four channels to be individually shut down, reducing power consumption to as low as 40nA and helping designers to meet or exceed cost and size requirements while providing the resolution and low power consumption that today’s battery powered and power-constrained applications require. These include consumer (personal media players, digital cameras and GPS devices); medical; industrial; appliance, and automotive (LED lamps and alarm/security systems) devices. The $15 MCP4728 Evaluation Board is available to help designers quickly evaluate the MCP4728 DAC in their applications, and the DAC is sampling now in a 10-pin MSOP package. Following four consecutive quarters of reductions, global inventories of chips have declined to appropriate levels, says market researcher iSuppli, clearing the way for stockpile rebuilding and higher sales in the second half of the year. After declining by 2.2 percent and 6.6 percent in the third and fourth quarters of 2008, inventories at global semiconductor manufacturers plunged by 15.1 percent in the first quarter, followed by a moderate 1.5 percent in the second quarter. At the end of the second quarter, iSuppli preliminarily estimates that inventories fell to $24.9 billion, down from the recent peak of $32.6 billion in the second quarter of 2008. This is another positive sign after increasing utilisation levels at foundries such as TSMC. The semiconductor inventory reduction effort was not limited to chip suppliers, with other segments of the electronics supply chain following suit. These segments include storage product makers, mobile handset OEMs, Electronics Manufacturing Services (EMS) providers and distributors. iSuppli forecasts that second-half inventories will increase modestly in unison with sequential revenue increases for the global semiconductor industry. After an 18.8 percent decline in the first quarter of 2009 and a 7.1 sequential increase in the second quarter, global semiconductor revenue will rise in the second half, in line with financial guidance from Intel Corp. and other chipmakers. Global semiconductor revenue will increase by a vigorous 10.4 percent in the third quarter and by 4.9 percent in the fourth, iSuppli predicts. Semiconductor inventories will rise by 5.5 percent in the third quarter and by 1 percent in the fourth to end the year at $26.5 billion, still an appropriate level for the demand, iSuppli predicts. Energy harvesting is a very interesting concept but hasn't yet made it into the mainstream. This is despite some quite compelling technology developments and key researchers such as TI's Gene Frantz looking closely at it. Part of the problem as been putting together all the bits to make it work, to take the power modules that convert vibration or temperature differences into power for a sensor. Another problem is that this power source tends to be intermittent and a capacitor or other storage can be needed. Then you need very low power electronics to make it work properly. All in all, a bit of a challenge, but now low power wireless microcontroller and module maker Jennic in Sheffield has developed a demonstration platform that solves all these issues. This platform combines a sensor with a 32bit controller and standards-based low power wireless link to send signals without batteries, eliminating the potential maintenance overheads of conventional battery power by harvesting energy from sustainable sources. This appeals to applications that don't usually take up new technology quickly such as Energy and Environmental Management, Building Management, Process Control, Condition Monitoring, Logistics and Asset Tracking, but having a ready-made platform allows sensors to be quickly and easily developed and deployed. Using energy harvesting means the sensors - usually temperature - can be easily deployed without wires and without having to have a costly maintenance schedule to go and replace the batteries. - Powercast, for RF energy harvesting. 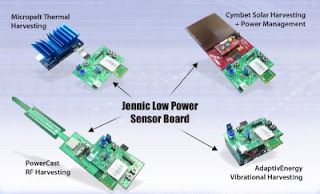 Jennic has developed an ultra low power sensor solution based on its JN5139 and JN5148 wireless microcontrollers that interfaces to each harvesting source to obtain the power needed to make periodic sensor measurements and transmission of the same over the wireless network to a central controller. The 32-bit RISC processor in Jennic’s wireless microcontrollers provides the processing capability to implement a software-controlled charge-and-fire energy management process, in which the microcontroller periodically wakes to measure energy levels, and then measures and transmits data when sufficient energy is available. Chip designer Initio is to use the ARC600 configurable core for a family of USB 3.0 and solid state drive (SSD) controllers. The ARC600 core, developed by ARC International of the UK, will be embedded within USB 3.0 bridge controllers and SSD controllers to provide a Serial ATA2 to USB 3.0 Bridge and/or individual SATA2 and USB 3.0 outputs, replacing an 8051 core. The ARC600 also has the advantage of occupying the same silicon area and operating at the same level of power as the 8051 it replaces. The USB 3.0 (SuperSpeed USB) market is expected to begin shipping as discrete silicon this year with broad deployment of SuperSpeed USB-enabled products expected in 2010 according to market research firm In-Stat. The interface will target applications requiring high rates and volumes of data transfer, such as external storage, consumer electronics, and communications devices with increasing amounts of storage. The replacement potential for USB 3.0 is enormous. In-Stat counts more than 2.6 billion USB-enabled devices shipped in 2007 and expects annual shipment growth of USB-enabled devices through 2012 to be 8.3 percent. SSD unit shipments will also enjoy strong growth. IDC predicts a compound annual growth rate (CAGR) of 76 percent from 2007-2012. "We're extremely pleased with the performance of the ARC 600 in our USB 3.0 chip design," said Jui Liang CEO at Initio Corp. "The core provides just the right silicon area and power consumption for the solid state disk controller and USB 3.0 application. It has more than enough processing power to handle the 5.0 Gbit/s data rate of USB 3.0 as well as the more complex USB 3.0 control logic." Initio is a leading ASIC supplier for storage applications with offices in Taiwan, USA, and China. Initio's product lines including interconnect bridge controllers for USB, Firewire 400/800, eSATA, SATA 1.5G/3G, and SSD controllers.